I would appreciate it if you would download our new Financial Health App and try it out. Backed by the power and security of Yodlee, AWS, ForgeRock, and Intrinio, we are seeking to develop the next generation financial application to help you get control of, and grow, your wealth. Once you try it out, give us feed back as we continue to develop lots of new features over the next few months. Over the last couple of weeks we discussed the “wild swings” in the market in terms of price movements from overbought, to oversold, and now back again. The quote below is from two week’s ago but is apropos again this week. The chart below also shows the short-term reversal of the market as well. Note how in just a few days the market went from overbought, to oversold, back to overbought. As noted previously, the market has not reversed to levels which normally signals short-term bottoms. The red lines in the bottom four panels denote periods where taking profits, and reducing risk, has been ideal. The green lines have been prime opportunities to increase exposure. As you will note, these indicators tend to swing from extremes and once a correction process has started it is usually not completed until the lower bound is reached. Important Note: This does not mean the market will decline sharply in price. The current overbought conditions can also be resolved by continued consolidation within a range as we have seen over the last two weeks. 2) The divergence between stocks and bonds still signals that “smart money” continues to seek “safety” over “risk.” Historically, these bond market generally has it right. 3) As discussed in “Will The Next Decade Be As Good As The Last,” the weekly chart below shows the S&P 500 hitting an all-time high last September before falling nearly 20% into the end of 2018. While the first two months of 2019 has seen an impressive surge back to its November highs, the market is starting to build a pattern of lower highs, and lower bottoms. More importantly, both relative strength and the MACD indicators are trending lower and negatively diverging from the markets price action. The bull market that ended in March 2000 preceded an economic downturn by a year. The October 2007 stock market peak preceded the December economic peak by two months. The March 2009 stock upturn led the June economic upturn by three months. Historically, stocks usually peak from six to nine months ahead of the economy. Which is why we look for possible stock market peaks to alert us to potential peaks in the economy that usually follow. And we may be looking at one. If you are a longer-term investor, these issues should be weighted into your investment strategy. While we did add exposure to our portfolios early last week, we are still overweight cash and fixed income. In the RIA PRO Equity Model – we bought Boeing (BA) on the initial plunge,, and added positions in JPM, AAPL and PPL. In the RIA PRO ETF Model – we added Healthcare (XLV), Energy (XLE) and Gold (IAU). As always, we start with trading positions which have very tight stop-loss parameters. If our thesis on the position is proved correct, the position size is increased and is moved into a longer-term holding status with widened safety protocols. This is how we approach linking longer-term views to short-term opportunities. Managing a portfolio of investments is simply measuring risk and reward and placing bets when reward outweighs the potential risk. Tweaking exposure to “risk” over time improves performance tremendously over the long-term. Lately, there has been an awful lot of talk about a “Goldilocks economy” here in the U.S. Despite a rather severe slow down globally, it is believed currently the domestic economy is going to continue to chug along with not enough inflation to push the Fed into hiking rates, but also won’t fall into recession. It is a “just right” economy which will allow corporate profits to grow at a strong enough rate for stocks to continue to rise at 8-10% per year. Every year…into eternity. A “Goldilocks Economy,” one that is “not too hot and not too cold,” is very much the fashionable explanation at the moment for all that’s allegedly good. “Goldilocks” presumes economic uniformity where there is none, as though there’s no difference between Sausalito and Stockton, New York City and Newark. But there is, and that’s what’s so silly about commentary that lionizes the Fed for allegedly engineering “Goldilocks,” “soft landings,” and other laughable concepts that could only be dreamed up by the economics profession and the witless pundits who promote the profession’s mysticism. 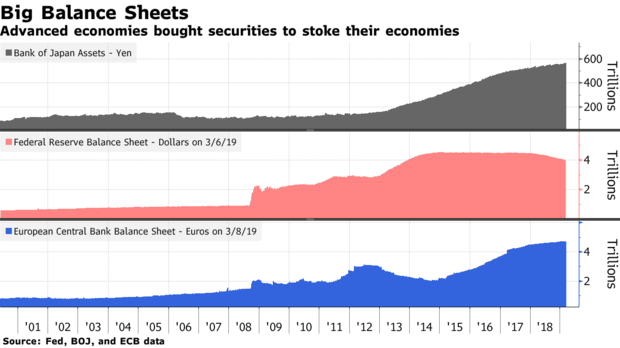 “Led by the Fed, many central banks have either held back on tightening monetary policy or introduced fresh stimulus, soothing investor fears of a slowdown. Fed Chairman Jerome Powell says he and colleagues will be patient on raising interest rates again, while European Central Bank President Mario Draghi has ruled out doing so this year and unveiled a new batch of cheap loans for banks. Unfortunately, today’s “Goldilocks” economy is more akin to what we saw in 2007 than most would like to admit. Job growth is slowing down. And recession risks are rising sharply. However, it isn’t just the economy that is reminiscent of the 2007 landscape. As noted above, the markets also reflect the same. Here are a couple of charts worth reminding you of. Notice that at the peaks of both previous bull markets, the market corrected, broke important support levels and then rallied to new highs leading investors to believe the bull market was intact. 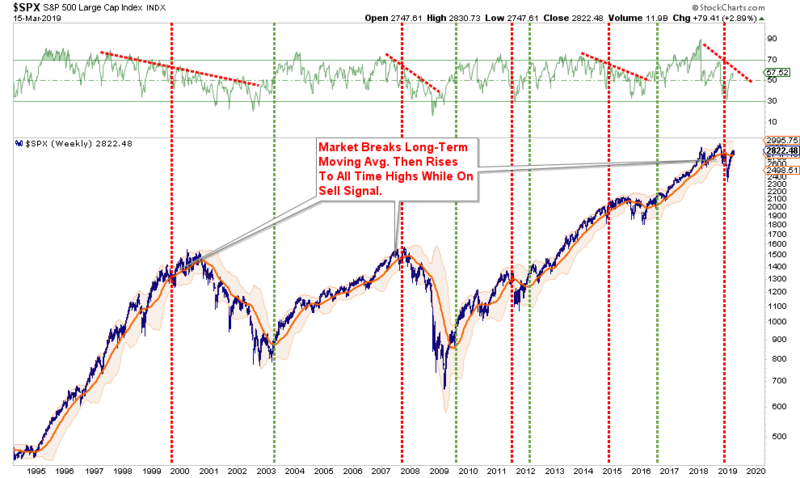 However, the weekly “sell signal” never confirmed that rally as the “unseen bear market” had already started. Currently, relative strength as measured by RSI on a weekly basis has continued to deteriorate. Not only was such deterioration a hallmark of the market topping process in 2007, but also in 2000. The problem of suggesting that we have once again evolved into a “Goldilocks economy” is that such an environment of slower growth is not conducive to supporting corporate profit growth at a level to justify high valuations. It is true that the bears didn’t eat Goldilocks at the end of the story…but then again, there never was a sequel. As we have been discussing over the last several weeks, the sharp rally in stocks has gone too far, too quickly, so just be patient here and wait for a correction/consolidation to increase exposure. The rally this past week was positive but remains very narrow in terms of participation. The break out of the recent consolidation range is bullish so you CAN increase exposure in portfolios modestly. However, the backdrop is not strong enough on a risk/reward basis to take the portfolio allocation model back to 100% just yet. As we noted last week, wanted to be patient and wait for a rally. That rally ran faster than expected but broke above recent resistance. If you are underweight equities or at target – rebalance portfolios to model weights currently. Hold positions for now and increase allocations in modestly as needed to get towards target weights. Previous Artificial Intelligence Or Real Stupidity? Next After Two Of The Greatest Bull Markets In U.S. History, Why Are Boomers So Broke?